One week later, on April 14, General Gage received instructions from Secretary of State William Legge, Earl of Dartmouth (dispatched on January 27), to disarm the rebels, who were known to have hidden weapons in Concord, among other locations, and to imprison the rebellion’s leaders, especially Samuel Adams and John Hancock. Dartmouth gave Gage considerable discretion in his commands. 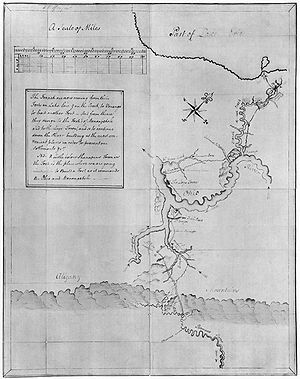 Gage issued orders to Lieutenant Colonel Francis Smith to proceed from Boston “with utmost expedition and secrecy to Concord, where you will seize and destroy… all Military stores…. But you will take care that the soldiers do not plunder the inhabitants or hurt private property.” Gage did not issue written orders for the arrest of rebel leaders, as he feared doing so might spark an uprising. In the days before April 18, Revere had instructed Robert Newman, the sexton of the North Church, to send a signal by lantern to alert colonists in Charlestown as to the movements of the troops when the information became known. In what is well known today by the phrase “one if by land, two if by sea”, one lantern in the steeple would signal the army’s choice of the land route while two lanterns would signal the route “by water” across the Charles River. Revere first gave instructions to send the signal to Charlestown. He then crossed the Charles River by rowboat, slipping past the British warship HMS Somerset at anchor. 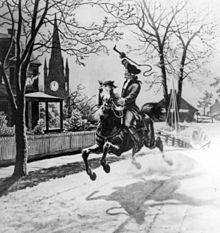 Crossings were banned at that hour, but Revere safely landed in Charlestown and rode to Lexington, avoiding a British patrol and later warning almost every house along the route. The Charlestown colonists dispatched additional riders to the north. Revere was captured and questioned by the British soldiers at gunpoint. He told them of the army’s movement from Boston, and that British army troops would be in some danger if they approached Lexington, because of the large number of hostile militia gathered there. He and other captives taken by the patrol were still escorted east toward Lexington, until about a half mile from Lexington they heard a gunshot. The British major demanded Revere explain the gunfire, and Revere replied it was a signal to “alarm the country”. As the group drew closer to Lexington, the town bell began to clang rapidly, upon which one of the captives proclaimed to the British soldiers “The bell’s a’ringing! The town’s alarmed, and you’re all dead men!” The British soldiers gathered and decided not to press further towards Lexington but instead to free the prisoners and head back to warn their commanders. The British confiscated Revere’s horse and rode off to warn the approaching army column. Revere walked to Rev. 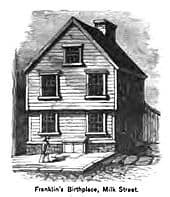 Jonas Clarke’s house, where Hancock and Adams were staying. As the battle on Lexington Green unfolded, Revere assisted Hancock and his family in their escape from Lexington, helping to carry a trunk of Hancock’s papers. The ride of the three men triggered a flexible system of “alarm and muster” that had been carefully developed months before, in reaction to the colonists’ impotent response to the Powder Alarm of September 1774. This system was an improved version of an old network of widespread notification and fast deployment of local militia forces in times of emergency. The colonists had periodically used this system all the way back to the early years of Indian wars in the colony, before it fell into disuse in the French and Indian War. In addition to other express riders delivering messages, bells, drums, alarm guns, bonfires, and a trumpet were used for rapid communication from town to town, notifying the rebels in dozens of eastern Massachusetts villages that they should muster their militias because the regulars in numbers greater than 500 were leaving Boston with possible hostile intentions. This system was so effective that people in towns 25 miles (40 km) from Boston were aware of the army’s movements while they were still unloading boats in Cambridge. 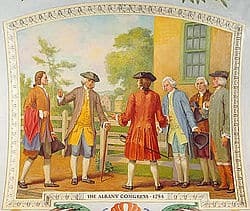 Unlike in the Powder Alarm, the alarm raised by the three riders successfully allowed the militia to confront the British troops in Concord, and then harry them all the way back to Boston.